What is Cub Scouts? Cub Scouts is part of Boy Scouts of America (BSA) and is a program offered to elementary school-aged youth. The scouts are arranged into dens based on rank (grade level) and led by 2+ adult volunteers (typically scout parents in the unit) registered with, and trained by Boy Scouts of America. These Dens fall under a Pack, led by the Cubmaster, Pack Committee Chair, and Charter Organization Representative (COR) – all BSA registered and trained volunteer leaders. 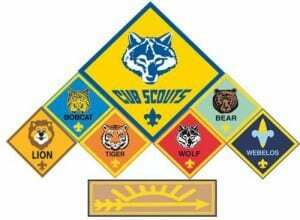 Cub Scout Ranks: Cub Scouts work towards annual rank advancement and are awarded rank for the indicated school year/age. Bobcat (ALL Grades): All Cub Scouts, regardless of join age, must first earn the Bobcat badge indicating knowledge of basic scouting principles and ideals. This is the first step on their Cub Scouting trail. Lion (Kindergarten): Lion scouts and their Adult Partner explore scouting with their den, and have lots of fun (modified uniform optional). Tiger (1st Grade): Tiger and their Adult Partner participate in fun adventures and activities, focusing on teamwork and cooperation. Wolf (2nd Grade): A little older and more independent, Wolf scouts explore the world around them. Bear (3rd Grade): Bear scouts learn more about the physical world and engage in interactive adventures. Webelos (4th Grade): Webelos adventures are modeled after Boy Scout merit badges requiring more study and practice to complete. Arrow of Light “AOL” (5th Grade): AOL scouts prepare to bridge to Boy Scouts. Arrow of Light is the highest award Cub Scouts may earn, and awardees can wear their award throughout their scouting career. What do Cub Scouts do? We have fun! Cub Scouting uses a fun, safe, family-oriented program to cultivate a lifelong sense of self respect and respect for others and their environment. Scouts explore the world around them and work both in team and individual/family activities and adventures. Camping, Pinewood Derby, games, hiking, exploring local historical and educational attractions, service to community, and age-appropriate life skills are all important aspects of Cub Scouts. How often do we meet or have activities? Dens typically meet 2 times per month.The Pack will have 1 meeting or event per month, and occasionally an additional event like a service project or special trip will be offered. Scouting is year-round, but the primary activity follows the school year with summer offerings of fun pack events, day camps, or resident camp (3 days, 2 nights). How much does it cost? Cub Scouts costs involve annual dues, uniform, rank handbook, and additional costs incurred for some activities (like camping, admission to a sporting event or museum, etc.). Annual dues are $75 (which includes payment to Council and insurance). The uniform can cost between $60-$125, and the handbook is $15-$20. We also have an annual fundraiser to cover additional event and activity expenses to keep the cost of scouting lower for the families. Scout items may be purchased at the Scout Store or online. How can I get involved? Just ask! The leaders are usually involved parents of the Scouts. Registered leaders (principal and assistant) are often needed for each den, as well as assistance on the Pack Committee, helping out with special events, or just helping with a pack or den meeting can all be HUGELY helpful. We can’t deliver a quality Cub Scout program without parent/family volunteer help. We ALL make the Pack go!